We’re always on the hunt for betting strategies to help players beat the house, but when it comes to roulette – the game of luck – many are a waste of time. The Martingale System is a common betting system used when playing real money roulette, but unfortunately it isn’t a good one. We take a look at why we consider it to be one of the worst systems to opt for due to the difficulty involved and the prerequisite of a large bankroll. The Martingale is a betting system which aims to maximise payouts, but it is said to only work in the short term and is recommended to only be used on even money bets. Players commence by making a one unit bet on an even money wager. You then need to either double the unit bet if you lose, or place the same unit wager as the initial bet if you win. But if your wager loses, you double the bet size to $20 on Red. The concept behind this is you are varying your bets based on losses, and thus the Martingale is considered to be a negative progression system. It is based on the idea after a losing streak a net win will mean you are up. We double our wager to $20. We double again to $40 if we lost the previous bet. We double again to $160 after two more losses. Let’s say from our example we finally win from our $160 bet on Black. This sees us net a win of $10, plus the $10 we won on the first bet – meaning we are up by $20. As you can see, this winning amount isn’t much for all the trouble, and not worth it at all. While this sounds all well and good in theory, specifically due to the idea you have to win eventually, there’s the big question – what if you don’t? There’s the limits of your bankroll and even if you are a high roller there is the maximum betting limits imposed by online casinos which will eventually stop you from doubling your wagers on a long losing streak. But these aren’t the only disadvantages. As we detailed above, if you could indeed double your bet to the point you win, then you are guaranteed to come out ahead, which is why on paper the system seems to work. For example, if you make a bet of $10 and lose nine times in a row, your 10th bet would have to be $10,240 – too high for many online roulette games (though there’s live dealer roulette with very high maximum table limits) and many land-based venues and too large for most player’s bankrolls. You are essentially recouping your losses – since the system is based on losses, every time you increase your bet you are trying to make up for the last loss and if you do win, you are just recouping your losses with a small net win, instead of winning big. Even when you win consecutively, the negative progression means you are betting small amounts, and thus only scoring small wins. Only beneficial in the short term – even the system itself claims it is only beneficial in the short term as you will either lose a huge sum of money or you will have reached the table limits or limits of your bankroll. Roulette is a game of luck – unlike blackjack strategies, betting systems won’t lower the house edge in roulette since it is a game of pure luck. So, why is the Martingale system so popular with many players? 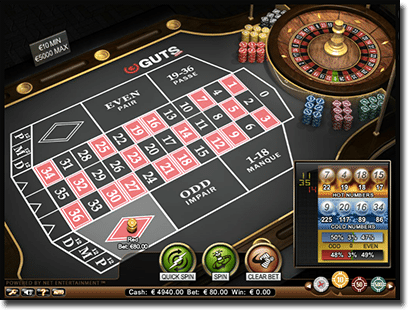 Since the system is said to increase the chances of winning – but only in the short term – many players believe it to be a good betting strategy to win real money on roulette. However, wins aren’t guaranteed and in the long term it doesn’t beat the house edge and therefore you will end up losing. You may want to try this system out in the short term, and if so you should do it properly – we’ve detailed exactly how below. There is a huge variety of roulette titles available online and if you do want to try the Martingale system we recommend doing so at secure sites (as per the credentials detailed on their homepage), such as the many we list across the site. Once you have clicked the links, signed up, made an easy and secure deposit, and located a roulette title you want to play, you can get started. It is incredibly important you only use the Martingale on even money bets since this is the basis to the betting strategy – these bets pay 1:1 and have the best odds of winning. These include, Red or Black, Even or Odd, and the first 18 numbers (1 to 18) or the second 18 numbers (19-36). You do need a fairly substantial bankroll for it to work well, and we recommend playing European Roulette or French Roulette only for the best house edge. You can find these variants at all our recommended online casinos. You can also trial the betting strategy in free play mode first at these online casinos, in order to see just how it works. But when you do use real money, with AUD accepted by each Internet roulette site detailed below, you do need to keep in mind the risks we’ve detailed above which come with the betting system. The best online sites to trial the Martingale system out include reputable web casinos which have been verified by top leading jurisdictions. These each accept AUD currency, and offer a substantial roulette catalogue, many featuring a live dealer casino where you can opt for larger maximum table limits too.